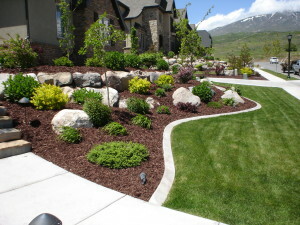 Pebble Creek Landscaping is an award-winning company based out of Draper, Utah that specializes in custom landscape design and installation in both new and existing homes. Based in Draper, we also proudly serve areas along the Wasatch Front: Alpine, Highland, Draper, Park City, Cottonwood, and more. With more than 20 years in the landscaping industry, we can help you design and build the perfect landscape to go with your dream home. We could feed you the usual statements about how your satisfaction is our priority, how affordable we are despite our commitment to quality, our dedication to water conservation and sustainable sources, our economical and water conscious sprinkler systems, our outstanding customer service, our focused attention to detail, and so on. Instead, let us prove our landscaping ability to you. We are so committed to your satisfaction that we have the pictures to prove what we can do for you. With over 20 years of experience in the Salt Lake valley landscaping industry, we are confident that we will not only meet, but exceed, your landscaping design and hardscape desires. You’re ready for your new landscape – and we can make it happen. Tap into our extensive knowledge base and expertise. Get a FREE landscape design consultation when you Contact Us Now.